A Palestinian man was shot and injured by Israeli forces while he was fishing on the coast of the Gaza Strip on Saturday, medics said. Medics in the besieged coastal enclave told Ma'an that the fisherman was in the area of al-Sudaniya in the northern Gaza Strip when he was shot. They added that he was shot in the leg by Israeli forces stationed at the Gaza Strip's northern border, and that the victim was subsequently transferred to the Shifa Hospital. An Israeli military spokeswoman said that "two Palestinians approached the security fence, and the soldiers operated in order to distance them." When they refused to comply, she added, the soldiers "opened fired towards the lower extremities of one of them." She said that the two were about 50 meters from the border at the time of the shooting. Israeli forces frequently shoot at Palestinians if they approach large swathes of land near the border that the Israeli military has deemed a "security buffer zone," and thus off-limits to Palestinians. A 70-year-old Palestinian man died of heart attack during an Israeli occupation forces’ raid on his home in al-Khalil city at dawn Saturday. Amjad Obeida, a relative of the old man Mohammed Obeido, 70, told the PIC that IOF soldiers “savagely” broke into the “martyr’s home at 0200 in the morning causing panic amid all those present in the house”. He said that the soldiers were looking for Mohammed’s son Mazen, adding that a scuffle broke out between the old man and the soldiers causing him a heart attack. He added that Mohammed fainted as a result then later died. For her part, Mohammed’s widow said that the soldiers kept on knocking on the door and when they entered they argued with Mohammed then violently pushed him without caring about his old age and health condition, leading to his instant death. Dozens of protesters suffered tear gas inhalation on Friday as Israeli forces dispersed a weekly protest in the village of Bilin. Israeli forces fired rubber-coated steel bullets, tear gas, and stun grenades at demonstrators as they marched towards annexed land near the separation wall. 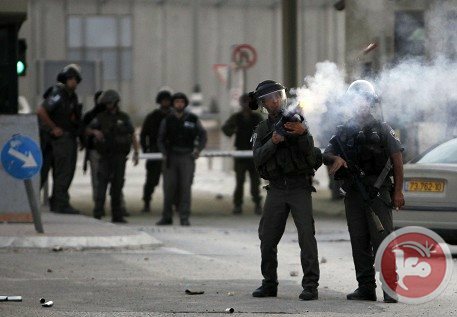 Twelve Palestinians were injured on Friday in clashes with Israeli forces outside Ofer jail near Ramallah, an Israeli army spokeswoman said. "Some 150 protesters set fire to car tires and threw stones at Israeli security forces, who responded using riot dispersal means," an Israeli army spokeswoman said. Twelve hits were identified on Palestinian demonstrators, with 11 people hit by rubber-coated steel bullets and one with a tear-gas grenade. Two Israeli journalists working for the Walla website were reportedly attacked by Palestinians during the protest, before being escorted from the area by PA security forces, she added. A day earlier, Israeli forces shot and killed two Palestinian youths during a Nakba Day rally near the Israeli jail. Nadim Siyam Nuwara, 15, and Muhammad Audah Abu al-Thahir, 17, were shot directly in the chest during the protest. 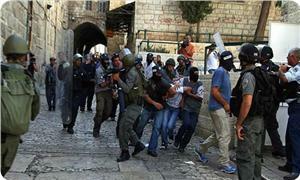 Over 15 Palestinians were injured on Friday during clashes in the East Jerusalem neighborhood of Issawiya, medics said. Medics told Ma'an that 11 people were lightly injured by rubber-coated steel bullets, while another four suffered moderate injures, including two people shot in the head. Tamar Obeid, 17, was detained during the clashes. Israeli forces fired tear gas canisters and stun grenades at the entrance to the East Jerusalem neighborhood after locals organized a demonstration to protest the killing of two Palestinian youths during a Nakba Day rally on Thursday. In Silwan, a local community center said undercover Israeli forces detained 10-year-old Said Abu Nab and teenagers Muhammad and Fayez al-Abbasi, without providing further details. 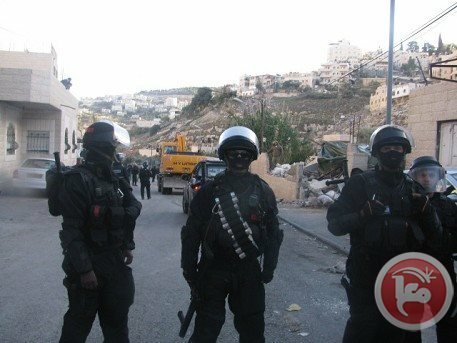 Clashes were also reported in the East Jerusalem neighborhood of Anata. There were no reports of injuries. 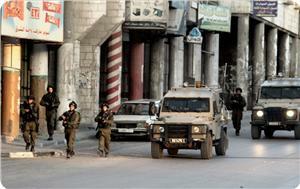 The Israeli occupation forces (IOF) at dawn Friday stormed Jenin city north of the Occupied West Bank. Local sources told the Palestinian information center (PIC) that the IOF raided several quarters in Jenin and carried out combing operations in different neighborhoods. The IOF reportedly took pictures of several Palestinian homes in Jaberiyat area and occupied a rooftop of a building under construction, the sources added. 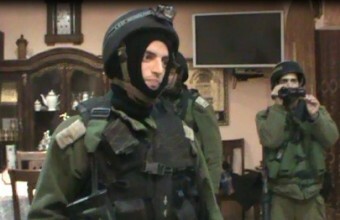 An Israeli military force invaded Burqa town northwest of Nablus and raided the house of Palestinian citizen Zaher Abu Omar in an attempt to arrest one of his sons named Ryaas. Palestinian youth activist Shadi Abu Omar told the Palestinian information center (PIC) that when the invading troops did not find the son in the house, they told his father to necessarily turn him in tomorrow to the Israeli intelligence in Hawwara military post. The Israeli occupation forces (IOF) arrested a young man from the same village yesterday, which increased the number of Palestinians kidnapped from the village to 50 detainees. In a related context, the IOF closed on Thursday evening Hawara military checkpoint in Nablus for one hour leading to traffic congestion. 11 Palestinians suffered injuries on Thursday during clashes with the Israeli occupation forces (IOF) in dial-Khalil city. According to medical sources in al-Khalil hospital, 17-year-old Ali Ghait was shot with a bullet in one of his eyes and rushed to the hospital for medical treatment. The clashes erupted when the IOF attacked a rally held by national and Islamic forces in al-Khalil on the anniversary of the Palestinian Nakba. The Palestinian information center (PIC) reporter said a number of Israeli snipers were deployed on rooftops of buildings near al-Sheikh neighborhood and al-Zawiya Gate and opened fire at Palestinian young men. 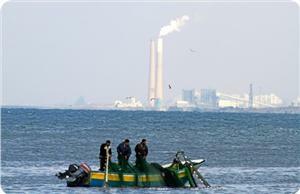 Israeli naval gunboats on Thursday evening opened fire at Palestinian fishermen’s boats off Gaza coast. 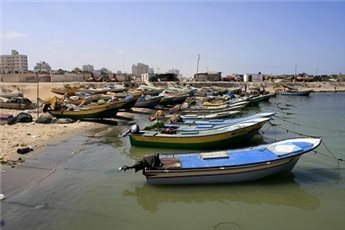 Nizar Ayyash, head of the Palestinian fishermen’s syndicate in Gaza said that Israeli gunboats opened heavy machine-gun fire at the fishing boats northwest of Gaza. No casualties were reported among the fishermen, according to medical source. Israeli police dispersed a rally marking the 66th anniversary of the Nakba in East Jerusalem on Thursday afternoon, injuring six and detaining four protestors. The rally came as protests erupted across the West Bank and Gaza as thousands turned out to commemorate the expulsion of 750,000 Palestinians from what became the state of Israel in 1948. Israeli forces arrested four Palestinian protesters at the East Jerusalem protest including Yasser Qaws, Ismail al-Khatib, Abed Barbar, as well as a fourth person who was not identified. Witnesses on the scene said that Israeli forces pushed and shoved participants, injuring six people including lawmaker Jihad Abu Zaneed and medic Nidal Abu Gharbia. Medics told Ma'an that three people were taken to hospitals for treatment following the dispersal by Israeli police forces. During the protest, participants raised black flags with "Alll Palestine is ours" written on them, Palestinian flags, and flags with the "key of return" printed on them. An Israeli police spokesman said in a statement that five "Arab suspects" had been arrested at the scene," but denied that there were any injuries. He added that "stones were thrown at officers." Two Palestinians were injured in clashes with Israeli soldiers in the Safa area of Beit Ummar village south of Hebron after forces raided their neighborhood. Spokesman for the popular resistance committee Mohammad Ayyad Awad said that Israeli troops raided Safa area, before residents in the area tried to stop them with rocks. 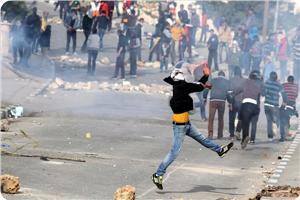 Israeli forces fired rubber-coated steel bullets, stun grenades, and tear gas in the ensuing clashes. Mohammad Khalil Mahmoud Abu Dayyeh, 23, was hit by a rubber-coated steel bullet in the thigh. Israeli forces tried to arrest him, but he was carried away to an ambulance before the forces could reach him, Awad said. Awad added that another 16-year-old was shot with a rubber-coated steel bullet in the left foot and was treated on the scene, while dozens of others suffered from excessive tear gas inhalation. An Israeli military spokesman did not immediately return to calls seeking comment. The clashes came amid protests across the West Bank in commemoration of Nakba Day, which marks the expulsion of 750,000 Palestinians from their homes in what became the state of Israel in 1948. 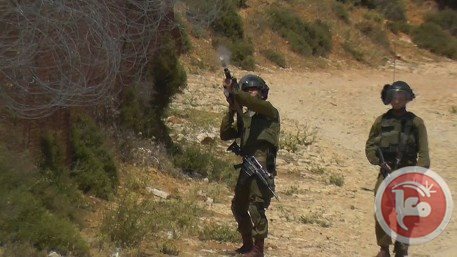 The soldiers have been heavily deployed at the entrance to the camp and summoned military reinforcements amid a state of alert announced by IOF on the 66th Nakba anniversary. A state of extreme anxiety overwhelmed the female students due to the heavy firing of tear gas and bullets. IOF attacks culminated in arbitrary military checkpoints, abrupt incursions of Palestinians’ homes, and the persecution of students, eye-witnesses further documented. Another child, 14, from Fawar refugee camp was arrested and carried to an unidentified destination after IOF raided his family home and rummaged through it. Another Aroub refugee was also arrested in the process. Along the same context, violent clashes broke out on Thursday between Israeli patrols and Palestinian unarmed young men in Bab Al-Zawiya in Al-Khalil while several shops were shut down by IOF, witnesses reported to PIC correspondent. 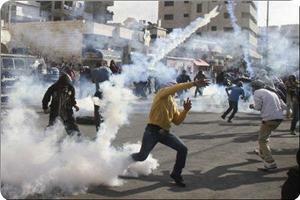 Several breathing problems were documented among Palestinian civilians due to the heavy firing of tear gas canisters. In a related event, a horde of Umm Al-Arayes settlers attacked and ruined Palestinians’ wheat and barley crops after abrupt incursions carried out under shield of Israeli army in Yatta town in al-Khalil on Thursday morning, as Nabil Younis, a teacher in the town, confirmed in a telephone conversation with a PIC news reporter. He further pointed out that around one and half tons of wheat and barley were destroyed in the attack. Palestinian citizens who tried to protect their crops were ordered to keep away from the targeted lands so as to smooth in settlers’ attacks. Israeli forces shot and killed a young Palestinian man and a teenage boy Thursday during a protest rally marking the 66th anniversary of the Nakba west of Ramallah in the central West Bank. The victims, according to medical sources, were shot by live ammunition in the chest. Their bodies were evacuated to Ramallah Medical Complex. Medics said three teenagers were also injured by live bullets. One was struck in the chest, one in the foot, and one in the leg. Doctors say they are in stable condition. 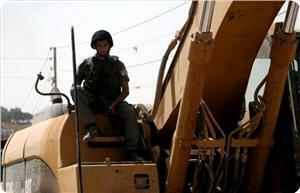 An Israeli military spokeswoman did not immediately return calls. Participants in the rally near Ofer detention center said they also wanted to show solidarity with Palestinian prisoners held without trial who have been on hunger strike for 22 days. Palestinians across the occupied territories and elsewhere were commemorating the Nakba, or catastrophe, of the founding of the State of Israel on Thursday. During the Nakba, more than 760,000 Palestinians -- estimated today to number more than 5 million with their descendants -- fled or were driven from their homes in 1948. Palestinian medical sources have reported that two Palestinians have been killed, and several others were injured, by Israeli army fire after the soldiers attacked a nonviolent protest near the Ofer Prison, west of the central West Bank city of Ramallah. 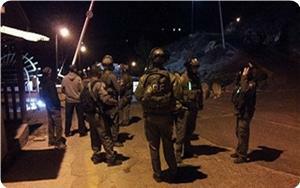 At least eleven Palestinians injured in Hebron. The Palestinian News & Info Agency (WAFA) has reported that dozens of Palestinians held a nonviolent protest near the prison compound, and that the soldiers attacked them by firing rounds of live ammunition. The Israeli military attack against the nonviolent protesters led to clashes between the soldiers and the unarmed Palestinians. The two slain Palestinians have been identified as Nadim Nuwwara, 17, from the al-Mazra’a al-Gharbiyya village, northwest of Ramallah, and Mohammad Abu Thaher, 20, from Ramallah. WAFA said that Israeli army sharpshooters targeted the protesters killing the two Palestinians and wounding several others. Most of the wounded Palestinians were shot in the upper parts of their bodies. The Palestinian were protesting the ongoing illegitimate Israeli occupation of Palestine, and marking the 66th anniversary of the Nakba (Catastrophe) when Israel was created in the historic land of Palestine, by displacing an attire nation, and destroying hundreds of villages and towns, turning the vast majority of the Palestinians into a nation of refugees. 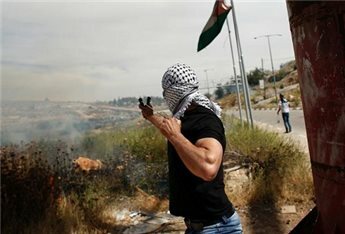 On Thursday at noon, at least eleven Palestinians have been shot and injured by Israeli army fire, and dozens suffered the effects of tear gas inhalation, after Israeli soldiers attacked Palestinian protesters, marking the Nakba, in the Bab az-Zaweya and the ash-Shallala Streets, in Hebron city, in the southern part of the occupied West Bank. Medical sources said the eleven Palestinians were shot by rubber-coated metal bullets, while one of them, identified as Ali Abu Hamdiyya Gheith, 17, was moderately injured after being shot in his eye, and was moved to the Al-Ahly Hospital in the city. Several residents were moved to the Hebron Governmental Hospital due to the severe effects of tear gas inhalation, while the rest received treatment by local medics. The Israeli Occupation Authorities threatened on Wednesday evening to carry out demolitions of 24 Palestinian homes in Samu’ town, south of al-Khalil, at the same time as agricultural crops were damaged by the Israeli Occupation Forces (IOF) east of Yatta, also south of al-Khalil. According to Samu’ Mayor, Youssef Salamin, IOF soldiers attacked Khirbet Gwen adjacent to the town and handed 24 demolition threats to Palestinian citizens, giving them a 20-day time limit to evacuate their homes, barracks, and tents. Such threats come as part of Israeli’s attempt to crack down on Palestinian native citizens and force them out of their lands so as to hold sway over them, Samu’ Mayor further maintained. 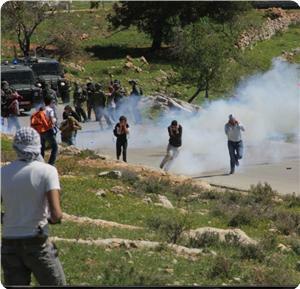 In another event, several wheat and barley crops were knocked down Wednesday by IOF in Yatta. Hadi Ahmed Rubi’ee told PIC news reporter: “An Israeli military tank bulldozed agricultural crops and ruined more than four dunums of wheat and barley planted lands”. “IOF soldiers are deliberately targeting our agricultural harvest to force us out of our native land amid heavy shooting and bomb explosions during intensive military drilling held in our land,” Hadj Ahmed added. A number of Palestinian students suffered breathing problems and others were arrested following violent confrontations with the Israeli Occupation Forces (IOF) in a Ramallah village while several demolition procedures have been carried out in Occupied Jerusalem. Eye-witnesses told PIC correspondent Israeli patrols have been heavily deployed at the main entrance to Abud village, west of Ramallah, on Wednesday morning before abruptly storming a school in the village and targeting classrooms with tear gas and sound bombs. Severe breathing problems and a state of extreme anxiety prevailed among students and citizens. IOF soldiers arrested the student Ali Abu Rasem from nearby Deir Mishal village inside the school and took him to an unidentified destination, the witnesses further documented. Palestinian citizen Jibril Abu Isneina from al-Khalil was also arrested and taken to an unknown location by IOF soldiers after having rummaged through his home and those of several citizens in different areas of al-Khalil. Other Palestinian civilians were summoned for interrogation by Israeli intelligence. In a related context, Israeli civil administration, backed by dozens of army patrols, attacked Yatta town near al-Khalil and handed demolition threats to several Palestinian natives, as it has done many times before, under pretext of illegal construction. The so-called Inspection Sub-committee in Beit El settlement scheduled 24 May 2014 as the projected date for a meeting over possibilities of knocking down the entire area. Palestinian Citizen Ibrahim Awad said he has long been awaiting for his house to be constructed and to set up a home with his family and children. But the Israeli authorities have come into the way of making his dream come true. The incident comes at a time when the Israeli municipality has demolished a house and three commercial compounds on Wednesday south of Occupied Jerusalem under pretext of illegal permits. Mohamd Amin Shkirat, owner of the demolished house, said in a press statement the house covers an overall area of 140 km2 and has been inhabited by ten family members. Shkirat and his family have been displaced once before when their house was reduced to rubbles a few years ago under the same pretext. The three demolished commercial buildings extend over areas that run, consecutively, over 55km2, 100km2, and 18km2. IOF soldiers, who provided an armed shield to the bulldozers and municipality crews, ordered shopkeepers and civilians to keep away from the demolition zone. 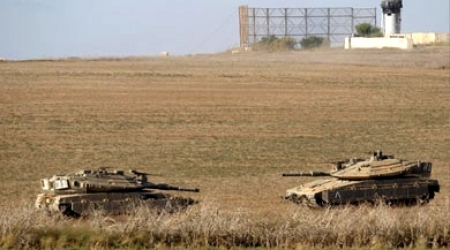 Israeli bulldozers carried out on Wednesday morning a limited incursion in the eastern border of the Gaza Strip amid intensive shooting at Palestinian houses. According to "ALRAY correspondent , 8 military vehicles of Israeli occupation forces include six tanks and two bulldozers pushed into the agricultural lands east of Shijaiyeh city . Eyewitnesses said that the IOF moved to a distance of more than two hundred meters, amid intensive flying of Israeli drones and razed the agricultural lands in the area. 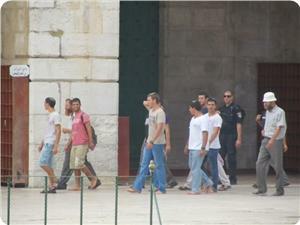 A group of Jewish female settlers attacked two Aqsa Mosque guards on Tuesday night with pepper spray. Jerusalemite sources said that the women settlers, who were loitering in the vicinity of the Mosque, suddenly sprayed pepper gas at the Asbat Gate, adding that two guards suffered burns as a result. The sources noted that groups of Jewish women perform Talmudic rituals on daily basis near the Mosque’s gates. Meanwhile, the Israeli police in occupied Jerusalem on Tuesday ordered two Palestinian women and a man not to approach the Aqsa Mosque for two weeks as punishment for chanting Allahu Akbar during a settlers’ incursion into its plazas. A group of Jewish settlers entered the holy site on Tuesday morning under heavy police protection and provoked Muslim worshipers and students at study and took photos of them. Worshipers and students started to chant Allahu Akbar in response to the provocation and denounced the settlers’ acts.